This took nearly three years to complete – started in early 2015, and with the blocks finished and assembled in August of 2015. However, it took two winters and into November of this year to finish the knitted band around the edge. To be fair, I only worked on the band intermittently and only in the winter – when the rest of the afghan could be warming my lap in the process. The unending nature of the band around an afghan this size (that’s a queen sized bed it covers) meant that I had to take frequent breaks to avoid going out of my mind with boredom. It is a generously-sized and very warm afghan. After two years of quasi-use, I’m a little disappointed that it is showing wear in the form of fluffing and mild pilling, which suggests that it might not take to many washings (and afghans should be washable). This was going to be a gift (but for whom, I never determined), but after using it for a few years – and having it show signs of use – I will likely keep it. Unfortunately, the colors are not appealing to me. Mind you, they are terrific colors, and I’m pleased at the way the afghan turned out but (as you can see by the bedspread), I prefer a different color palette. New techniques (Finished Projects Installment) – Mitered corners! I chose a band from one of the squares of the Great American Afghan book (one of the squares that I did not use for the precise reason of the band that I – at the time – did not want to tackle). The straight sections of the band were attractive and easy, and the instructions for the mitered corners were OK – they only gave directions on knitting the corner, without direction on where to start the mitered corner. I’m still not sure about that one. Stopping point reached. Not all leftover sock yarn was consumed (that would be either crazy, or obsessive, or both), but it reached a size where I thought that concept was well represented and the afghan would be useful. Size is about 36″ x 60″ – big enough for a lap afghan, big enough for a nap afghan, but not big enough for a blanket (or for 2 people). Because it is made from sock yarn, it’s not heavy, which works for me. Adjustments: I made it a 20 stitches and 20 rows, instead of 10. Lessons learned: Stitch markers are important. Even though this was an easy project, it was “easy” to get off count on the rows. 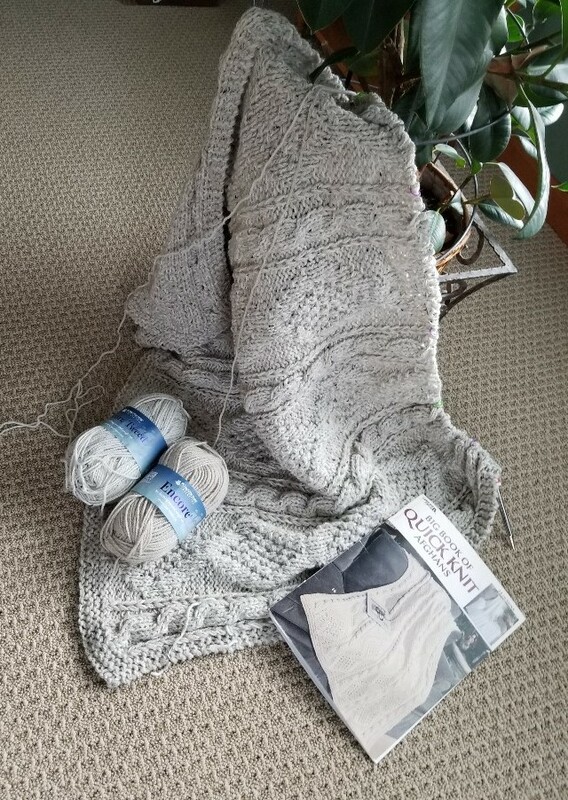 Goals: Good “mindless knitting project” to get me through a stressful work period with two large projects on the burner. Mediocre: Stash buster project. Yes, I managed to (nearly) use up 13 sets of leftover sock yarn, but the overall project has a very “patchwork” feel, which is not really to my taste. So, +5 for using up yarn, plus an extra +1 because the size of the project tended to be “just right” to use up a particular color per panel, but -3 for the lack-of-matching= still worthwhile in the project completion department. Update March 22, 2016: I use this afghan a lot more than I expected. It is lightweight (because of the sock yarn) and airy (because of the garter-stitch giving it loft), and just right for a lap afghan. I tend to be warm all the time, so I don’t need a heavy blanket when curling up with a book (or with knitting), but sometimes, a bit of afghan on the lap is nice. Progress is being made. This will not be a large item – more suitable for a lap afghan. Not sure what I will do with it when it’s done. Not sure I’ll know when it’s done. There’s is always more sock yarn. If you are counting, there are 11 different colorways represented, here. 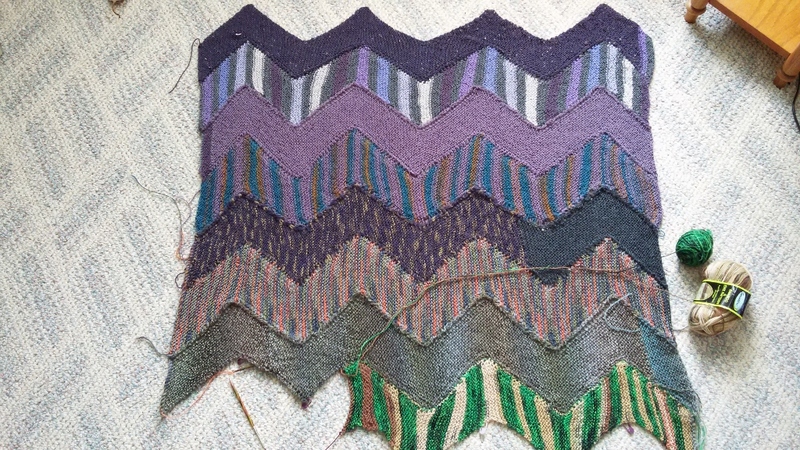 Current progress on Zig Zag afghan.